Sixteen final year fashion students from Middlesex's BA Fashion Design and BA Fashion Textiles courses presented their collections to industry and media at a runway show in the Vinyl Factory Soho on Friday 3 June. The students were carefully selected by an expert industry panel including Kim Howells, Fashion Director at Hunger and Kylie Griffiths, Fashion Editor-at-large at Vice Magazine. Each student showcased three designs. Varying from the gender fluid to statement cuts to full denim, all designs combined the imaginative with the striking. “Our BA Fashion Programmes create young, exciting, talented designers and image-makers, who are industry ready,” says Meg Osborne, Director of Programmes for Fashion at the University. 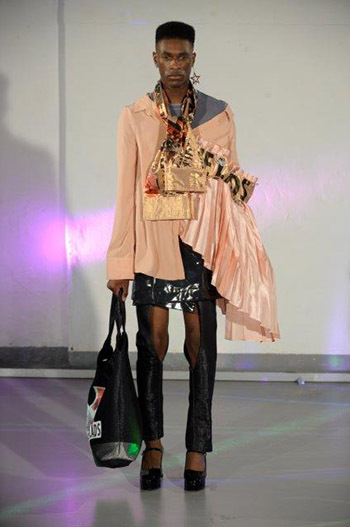 “Middlesex fashion students excel in both skills and imagination and we represent the best of London’s emerging talent. Now in its third year, the Live Catwalk Communication Campaign was organised by a team of Fashion Communication and Styling students together with the University’s fashion team. “It’s fast-paced, independent and challenging studying at Middlesex. The tutors really give you the freedom to discover yourself and your style,” says Charlotte Roden, one of the show’s student designers. “After the reaction to my graduate collection, I am interested in pursuing myself as a designer into possible further education,” she added. Middlesex has a long standing commitment to nurturing the future of British fashion with alumni now working at global brands such as Marchessa, Burberry and Tom Ford. "The reason I chose Middlesex was for the quality and quantity of contact tutor time. Studying at Middlesex has prepared me well for a future in industry and filled me with excitement," said Melanie Miles, another of the show's student designers. See a full gallery of images from the 2016 end-of-year fashion show on our Facebook page, and watch our video below to see some of the highlights. Read industry coverage of our students' work from Vogue, Wonderland Magazine, Dazed Digital and The Kinsky. Learn more about fashion courses at Middlesex University.